Which of Meade’s corps commanders have park avenues named after them? Which of Meade’s corps commanders have statues at Gettysburg? 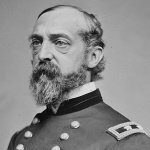 Who were Meade’s Corps Commanders at Gettysburg? Army of the Potomac. The Union (USA) army at Gettysburg. Who commanded the Union army at Gettysburg?